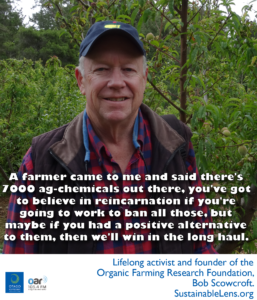 A farmer came to me and said there’s 7000 ag-chemicals out there, you’ve got to believe in reincarnation if you’re going to work to ban all those, but maybe if you had a positive alternative to them, then we’ll win in the long haul. Bob Scowcroft, the co-founder and former executive director of the Organic Farming Research Foundation talks about what lead him to a life and career of activism. What does lying down in stop signs have to do with crop regulations, and what are the challenges facing today’s passionate young activists? A master storyteller, Bob held us transfixed as we recorded this interview in the Alan Chapman Garden at the University California Santa Cruz. It was the times…someone I barely knew dropped out of school, went to war and came back in a body bag – that caught my attention, high school kids were dying for something I had no understanding of. I was going to be drafted if I didn’t go to college. It blew my mind, something that I’d never thought about or heard about – the fact that colour of your skin framed whether you could go to college or not. There was no doubt I was going (to Vietnam), but there was also no doubt I was not going to go. The illogical assumption in a four-way stop sign in Decatur Georgia would have a ripple effect was really absurd…however as more recent philosophers have pointed out about the butterfly’s wings…this was called the new mobilisation, and there were probably tens of thousands of people that laid down in four-way stip signs throughout the US trying to shut it down – to stop the war. I was asked, would you write a letter on FoE letterhead supporting the first organic law in California? Family farms whose grandmothers said if you take this farm don’t you ever use poisons on it…we don’t kill here, we create life here. One of last great holdouts are academic institutions…the billion dollar investment is product oriented, not information oriented. It took 30 plus years to get from 0.001% to 4.5%, there’s lot of work ahead of us. We need a cadre of young policy activists…and a young generation so passionate to put their shoulder to the plough. (Success) Watching philanthropic families get it, doing due diligence and fund it. I’ve never been an I, it’s always we. (Activist) To this day, absolutely. (Advice) Try to buy one item, certified organic every day.